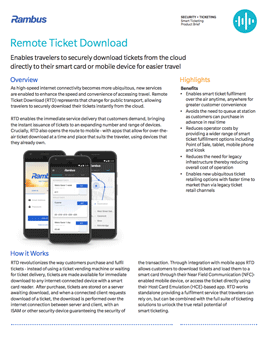 The Rambus Remote Ticket Download (RTD) enables travelers to securely download tickets from the cloud directly to their smart card or mobile device for easier travel. RTD enables the immediate service delivery that customers demand, bringing the instant issuance of tickets to an expanding number and range of devices. Crucially, RTD also opens the route to mobile - with apps that allow for over-the-air ticket download at a time and place that suits the traveler, using devices that they already own.